A flash-card system for students of Mandarin Chinese. Is there a better alternative to Mandarin Tutor? Is Mandarin Tutor really the best app in Language category? Will Mandarin Tutor work good on macOS 10.13.4? Mandarin Tutor is language flash-card software for the Mac. Mandarin Tutor is a computer-based flash card system used that can be used to help you learn Chinese characters. It allows you to practice a lesson sequentially, randomly, or by character / pinyin / english. As you learn characters, you can mark them off, continuing until you have learned all the characters in a lesson. 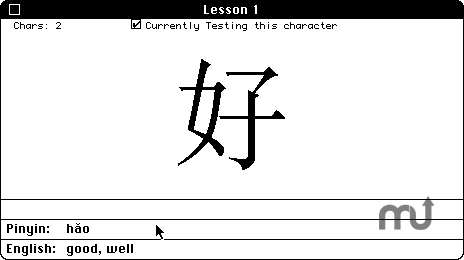 Version 1.1 of Mandarin Tutor fo Mac OS 7-9. Mandarin Tutor needs a rating. Be the first to rate this app and get the discussion started! Mandarin Tutor does not attempt to teach you Chinese, but when used by a motivated student it can definitely help the learning process. Currently there are only pre-made lessons available. We are currently investigating new file formats that would allow for a richer learning environment. Mandarin Tutor includes one sample lesson (numbers). The software's Web site's archives (self-extracting .dmg) contain additional lessons.